If you are planning the best day of your life, but are still doubtful on where to hold the reception for your wedding, Taormina is certainly the answer you was looking for: thousands years of history, a luxuriant and breathtaking nature and the top-level services provided by the La Plage Resort will trasform your wedding in Taormina in an unforgettable experience for all your guests. There are many things that you should consider while organizing you wedding: Taormina is very likely not your hometown and the assistance of a professional staff, such as the one of the La Plage Resort, will be very helpful to assist you though every aspect of the italian laws and permits issues for your reception. Book now your first visit to the La Plage resort with your beloved and find out how this jewel of the Ragosta Collection could easily become the perfect venue for your wedding. 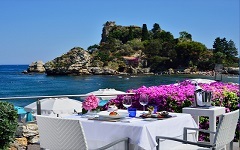 Taormina and its wonderful surroundings will do the rest to make your best day as magic as you have always dreamed.